Last weekend, as expected, 20th Century Fox's Maze Runner finale The Death Cure finally took down Jumanji: Welcome to the Jungle at the box office, and now it only faces minimal competition with just one movie opening in wide release this weekend, Winchester. While this Maze Runner franchise finale didn't post a massive opening, its $24.1 million was more than enough to take down both Jumanji and an expanding Hostiles, and with just one new release, debuting in far fewer theaters, we're predicting that The Maze Runner: The Death Cure, comes out on top again with $14.6 million. If this prediction is accurate, it will represent roughly a 40% drop in its second weekend for this franchise finale, which is slightly better than the second weekend drop for 2014's The Maze Runner (46.4%) and much better than 2015's The Maze Runner: The Scorch Trials (56.4%). While this adaptation wasn't exactly a hit with critics, posting a 45% rating on Rotten Tomatoes, this young adult franchise still has a huge fan base from the James Dashner novels, and it wouldn't be surprising if the fans showed up in full force for repeat viewings to end this trilogy on a high note. The movie is also performing well internationally, with $83.9 million from its opening weekend for a worldwide total of $108.1 million, from a relatively modest $62 million production budget. One reason why The Maze Runner: The Death Cure will repeat atop the box office is because its only competitor in wide release, Winchester, won't have nearly as wide a rollout. The Maze Runner: The Death Cure opened in 3,787 theaters in its opening weekend, and will most likely remain the same this weekend. 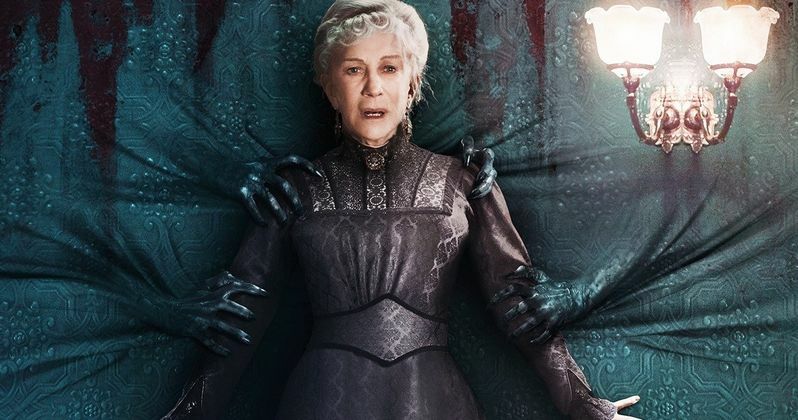 While it will be a few days before we know the official theater count for Winchester, it is being estimated at 2,300, a far cry from The Maze Runner: The Death Cure's rollout, and we're predicting that it debuts in third place with $8.3 million, behind the impressive Jumanji: Welcome to the Jungle, remaining in second place with $9.8 million. Winchester is inspired by true events. On an isolated stretch of land 50 miles outside of San Francisco sits the most haunted house in the world. Built by Sarah Winchester, (Academy Award-winner Helen Mirren) heiress to the Winchester fortune, it is a house that knows no end. Constructed in an incessant twenty-four hour a day, seven day a week mania for decades, it stands seven stories tall and contains hundreds of rooms. To the outsider it looks like a monstrous monument to a disturbed woman's madness. But Sarah is not building for herself, for her niece (Sarah Snook) or for the troubled Doctor Eric Price (Jason Clarke) whom she has summoned to the house. She is building a prison, an asylum for hundreds of vengeful ghosts, and the most terrifying among them have a score to settle with the Winchesters. Rounding out the top 10 this weekend will likely be Hostiles ($5.1 million), The Greatest Showman ($4.9 million) The Post ($4.6 million), 12 Strong ($4.1 million) Den of Thieves ($3.9 million), The Shape of Water ($3.1 million) and Paddington 2 ($2.9 million). Also debuting in limited release this weekend is Vertical Entertainment's Bilal: A New Breed of Hero, IFC's Cage Fighter, Sony Pictures Classics' A Fantastic Woman and Cinedigm Entertainment's Scorched Earth, although no specific theater count details were given. Looking ahead to next weekend, February 9, there will be four new movies arriving in wide release, with Warner Bros.' The 15:17 to Paris, Universal's Fifty Shades Freed, Sony's Peter Rabbit and Pantelion's La Boda de Valentina. Take a look at our box office projections for the weekend of February 2, and check back on Sunday for the top 10 estimates courtesy of Box Office Mojo.